The Tea Party fixation matters: It's already complicating the latest fiscal showdown in Congress. Once again, John Boehner is in a bind. Here’s why it matters. First, now that vote on intervening in Syria has been indefinitely tabled, Congress can get back to its previously scheduled disaster -- the continual confrontation over the budgeting process. (The federal government's funding will run out at the end of the month, and the debt ceiling will be hit sometime in October, forcing Congress to authorize more spending or provoke government shutdown and default, respectively.) The ardor on the right for defunding Obamacare has already thrown a wrench in the process, making shutdown or default harder to avoid. Second, it’s the latest chapter in the ongoing struggle for dominance between the Republican establishment and grassroots -- a struggle that will determine the beleaguered party’s fate, and by extension the political future of the country, in the years to come. When the “defund Obamacare” movement began this summer, most Republicans believed it was safe to ignore it. It was not so much a legislative strategy, after all, as a magical-thinking fever dream. The idea: Since the expiration of federal funding at the end of this month coincides with the October 1 opening of the Obamacare exchanges, Congress, according to the defunders, should agree to keep funding the rest of the government, but strip the money needed to implement the health-care law. When others pointed out that the Democrat-controlled Senate was unlikely to pass, and Obama was unlikely to sign, a proposal gutting his hard-won signature domestic achievement, and that the result would be a government shutdown for which Republicans would be blamed, these people were informed that they were creeps and liars and wimps. It was, come to think of it, not too dissimilar from the pundits who continue to fault Obama for not being able to get anything done: Point out that the Congress doesn’t seem inclined to go along with his plans, and they reply, Well, with that attitude, of course not. Just 13 senators and 80 members of the House of Representatives signed onto the defunding effort, short of a majority of the Republican caucus in both houses. But early predictions that the initiative would wither for lack of support proved premature. Over the summer, it became the central focus of the Tea Party Industrial Complex, which was having trouble getting partisans riled up about other things, like opposing immigration reform. Heritage Action, FreedomWorks, the Senate Conservatives Fund, and the Club for Growth all got on board. 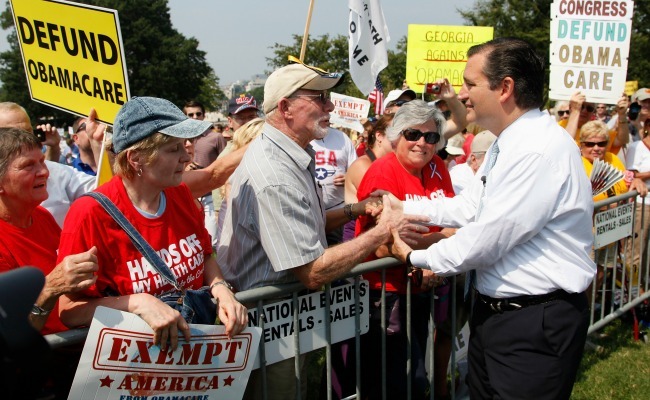 The Tea Party Patriots and ForAmerica held rallies in 10 cities under the slogan, “Exempt America.” (Congressional staffers and big business have already been “exempted” from the strictures of the Affordable Care Act, the groups contend; now it’s time to exempt the rest of us.) Heritage Action hit nine more cities. A crowd of hundreds packed a hotel auditorium in Dallas to see Senator Ted Cruz. Tea Party Patriots members could download toolkits from the group's website to help them write their local newspaper and call their local congressman. ForAmerica generated 40,000 such phone calls, and started releasing campaign-ad-style videos aimed at squishy senators like Minority Leader Mitch McConnell, comparing them to chickens. With the party’s conservative wing rallying behind the defunding idea, leaders could no longer ignore it. This week, Majority Leader Eric Cantor proposed a compromise: The House would pass two measures, one funding the government, the other defunding Obamacare. The Senate would have to vote on both, and some Democrats trying to get reelected in Republican states where Obamacare is unpopular might be put in a tight spot. (With voters overall, Obamacare is unpopular, but repealing it is also unpopular, and so is defunding it.) A vote on the Cantor proposal was scheduled for Thursday. A sweaty Rep. Tim Huelskamp of Kansas, gesturing toward the House, announced, “We’ve got some problems in the building behind you. We’ve got some folks that say they’re opposed to Obamacare, but they’ve just announced a strategy to make absolutely certain that the U.S. House will not defund Obamacare.” Boooo. “The speaker and the majority leader have just announced a strategy in which there’ll be another vote that doesn’t count, so on October 1, Obamacare will be funded.” Boooo. The Tea Party Industrial Complex came out against the "trick" bill. By midday Wednesday, the Cantor proposal had been pulled and Thursday's votes canceled as Republican leaders went back to the drawing board. It is not news, of course, that the raw zeal of the Tea Party has turned out to be a mixed blessing for the Republican Party since helping propel its candidates to victory in 2010. A movement essentially anti-authoritarian in nature, it has proved as eager to train its fire on GOP authority figures as those on the left, an indiscriminate fire hose of rage that soaks whoever stumbles into its path. Herman Cain -- remember him? -- exhorted the crowd, “Anybody who said the Tea Party has died, they have lied, because the Tea Party is alive and well.” The crowd on Tuesday was not the Tea Party of yore, when Glenn Beck -- remember him? -- packed hundreds of thousands onto the Mall. And yet it still had the power to stop the speaker of the House of Representatives in his tracks. I stopped to chat with Judy and Francis Kelly, a nice couple in their 60s from Johnstown, Pennsylvania, who’d come on a bus with a bunch of other Pittsburgh-area activists in matching red-white-and-blue name tags. Judy, a retired bank teller who considers herself “right of center,” actually saw some virtues in the Affordable Care Act. She was glad it would stop insurers from discriminating against preexisting conditions, and thought it was good for young people to get to stay on their parents’ insurance longer, and was glad it didn’t cover abortions. But the rest of it -- the government forcing people to buy health insurance -- went too far.